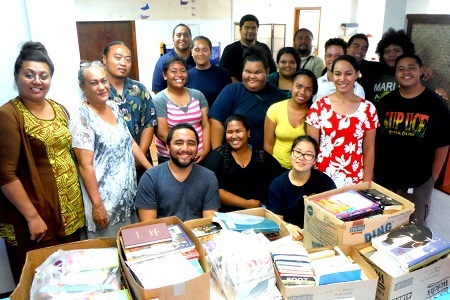 On Monday, November 23, members of the Psychology Club at the American Samoa Community College (ASCC) donated over 200 books to the Alliance Against Domestic and Sexual Violence (ASADSV), who will in turn add them to the collection of the library currently being planned for the Tafuna Correctional Facility. The Psychology Club spent the last two weeks manning a table set up in the Quad area of the ASCC campus, where students, faculty and staff were welcome to donate any books or magazines they no longer had use for. Helsham said the club plans to engage in future projects that involve both Psychology and community service. “The majority of the ideas come from my club officers and members,” he explained. “I’m just their advisor giving guidance to their practice.” The Alliance Against Domestic and Sexual Violence is still accepting book and magazine donations, and can be contacted at 699-0272.